PAUL WELLER IS 60, a landmark he celebrates with an in-depth MOJO magazine interview (in UK shops right now) and an all-acoustic album laden with bucolic strings. A token of surrender to serenity and retrospection? No – just the latest departure in the Jam man’s career of left-turns, and an opportunity to confront the “dark forces” aligning in Britain and the world. “It’s like the first stirrings of World War III,” he warns. MOJO 299, in UK shops and available to order online. Along the way, he explains his radically organic approach to new album, True Meanings – due on September 14 but presaged by current ‘single’ Aspects. The album’s ruminative mood reflects a heightened concern for the world around Weller, as he fears for his children’s futures. All eight of them. It’s painful for the perennially forward-facing Weller to wax so pessimistic. However, there’s something good for fans to look forward to as Weller reveals that compiling the set-lists for shows at the Royal Festival Hall has involved re-listening to Style Council songs. Ultimately, he predicts a promisingly seat-of-the-pants affair. 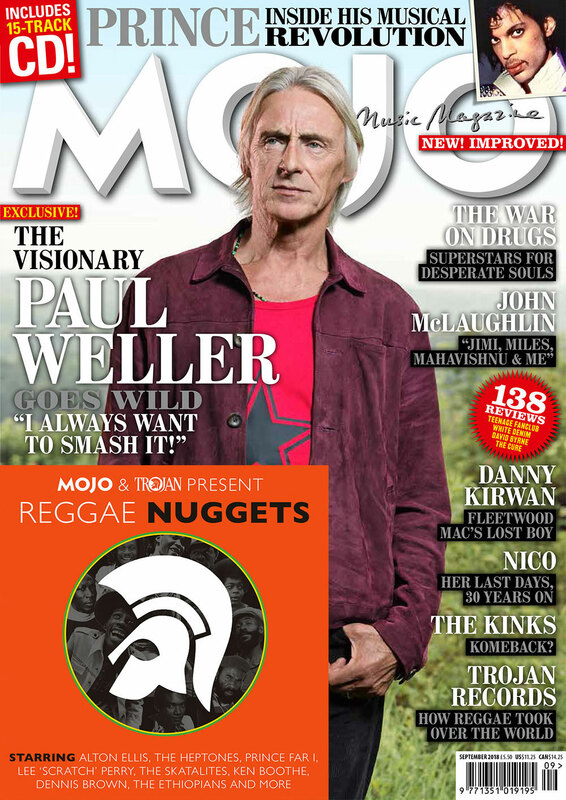 MOJO 299, featuring Paul Weller, is in UK shops now. Also in the magazine: a covermount CD of Trojan-sourced Reggae Nuggets features tracks by Lee “Scratch” Perry, Dennis Brown, Ken Boothe, Alton Ellis and more; The Revolution remember Prince, the boss from hell with God-given talent; The War On Drugs scale the heights; the Mahavishnu and Miles man John McLaughlin relives the Fusion Wars; The Cure and David Byrne renew themselves; Kinks reunion latest; the strange tales of country legend Blaze Foley and VU ice queen Nico. Plus! Danny Kirwan, Swamp Dogg, Edwyn Collins, Seymour Stein, White Denim, Snail Mail, Sylvain Sylvain, the “Bad” Woodstock and more!